Undulating was probably an understatement for the first lap of twelve miles. At least after passing the start line runners knew they were well over halfway round and did not need to do two of the most testing hills a second time. ISABEL GREEN, Jim Brown and MARK GOODWIN were together or in sight of each other for most of the race. In the end Isabel got away at about 18 miles and finished in an excellent 2:46:48. JIM said he was surprised and delighted to improve his time for 2019 by 2 minutes 40 seconds, and he got another early season suntan. He was third man aged 65 to 69 in 2 hours 48 minutes 19 seconds. MARK GOODWIN was third aged 60 to 64 in 2:50:54. LIZ CARVELL came in with a new PB of 3:46:35. An improvement of 13 minutes She said, “It was a lovely run in nice weather, the uphills were quite tough but the downhills made up for it.” KAREN ELLIS was pleased with her new PB of 3:09:58 and MARIA THORNE finished in 3:50:48. The Oakley 20 maybe tough but it’s seen as excellent preparation for a Spring Marathon. Sixteen Spartans raced in the Lee Valley Run Fest – nine in the half marathon and seven in the 10K. MONICA SMITHSON was 244th in the race with a chip time of 60 minutes 24 seconds just ahead of SHERYL HANN at 245th with a chip time of 60 minutes exactly (but a gun time of 60:37 compared with Monica’s 60:36). TREVOR BROOM came in with a new personal best 62:20, that’s a one minute improvement, and SALLY McBRIDE, in her first race this year, with 63:46. New member DZENANA TOPIC finished with 65:07. They all helped out with registration before their runs today and said the course as always was fast, flat and just a lovely route along the river. ERICA GRAYSON said the Lee Valley Half Marathon was a very well organised event. It was on a flat course but unfortunately no shade in the unexpected beautiful March sunshine. Her time of 1 hour 58 minutes 32 seconds was her best this year. She was 275th. Another Spartan, LIZ SMITH, was just behind at 276th in 1:58:42. STEVEN DOBNER said, “A gorgeous morning greeted all the runners, although the support was sparse it was a very flat run over mostly good, dry trails with the odd bridge thrown in to test the hip flexors. I was happy to sneak a PB (personal best) even though it didn’t feel like I deserved one.” Steve finished in 2:04:29 and DAVE PATTMAN in 2:04:30. PAUL JENNINGS, DAVID ACKERY and JONATHAN JONES times for the Lee Valley Half Marathon were 2:08:47; 2:18:48 and 2:23:33 while KAREN BROOM added some more miles to her London Marathon preparation with 2:25:48. PRIYA CLARKE beat three hours with precisely 2:59:59. “The weather was superb for the London Landmarks Half Marathon,” said Spartan NEAL MUGGLETON “and really showed London at its best.” This was a massive event with thousands of runners, some taking 30 minutes to cross the start line, and Neal finished in 2:03:11. It was 2:03:13 for HAZEL SMITH at London Landmarks. Debbie Blantern ran the Thorney 10K in 58:17, more than 3 and a half minutes quicker than her previous best. Margaret Montgomery did the Limmasol Half Marathon in 3:23:29. 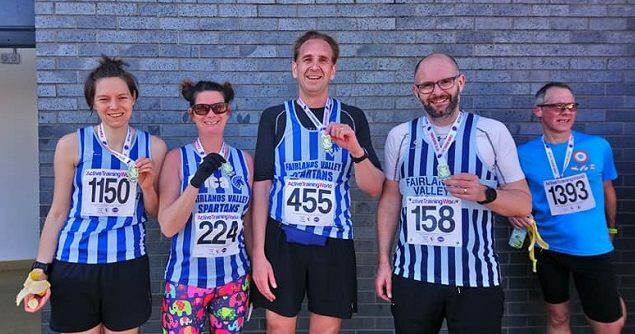 Some other Spartans including Paul Maguire, Tim Sagan, Nick Gill and Wendy Tharani ran a pre-marathon training event with Gade Valley Harriers in Kings Langley. Steffan Ford was fourth at Stevenage in a new PB of 18:13. Danny Sutton also ran a new PB of 21:06. To complete the trio David Ackery ran a new PB of 27:15. Brian White was back in parkrun action running 22:19. Congratulations to Lee Pickersgill and Roger Biggs who both completed their 50th parkrun at Stevenage. Ashley Schoenwetter ran 25:31 in her second visit to St Albans. Darryl Stevens paid his first visit to Rickmansworth and ran 34:36. Andy Jay is edging closer to his 100th parkrun notching up his 95th run and going sub 25 at Panshanger (24:43). He was joined by Tom Sauka who ran 25:23. John Harris and Jo Bowdery made the short trip to Letchworth. John was 6th overall in a new PB of 21:00. Jo was 7th female in 25:44. John Roxborough was in North Wales at the Newborough Forest parkrun near Caernarfon. He was 12th overall in 22:23. Fairlands Valley Spartans are into week twelve of their marathon training plan. Are you running a Spring marathon? Whether you want to get round and enjoy; are a first timer; want a personal best or expect to go “Sub Three” the Spartans are the local club for you, there are group training opportunities five days a week. Have a look at www.fvspartans.org.uk or the club’s Facebook page. A total of 528 runners took part. A total of 463 runners took part. A total of 396 runners took part.